OpenSCAD is software to create solid 3D CAD Models but other than most 3D CAD programs a model can be created with a programming language. Although OpenSCAD is often used to create models for 3D printing it also very capable as a tool for creative coding. Creative coding is more about being expressive than being functional. 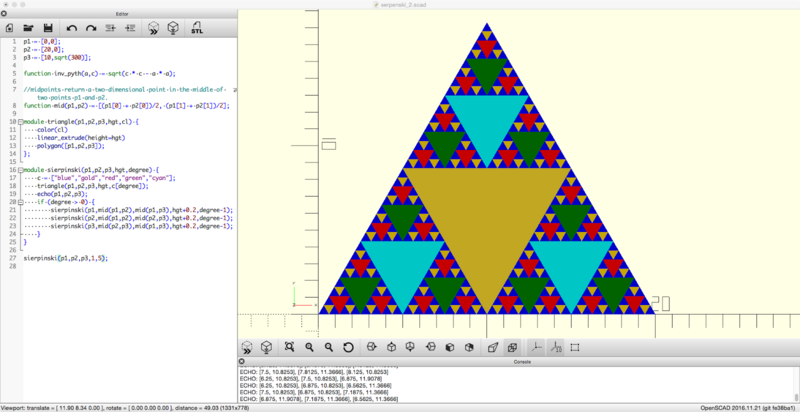 Sierpinski triangle made in OpenSCAD (recursive algorithm). I've been using OpenSCAD for over a year now for my 3D printing projects but as of late I'm exploring the creative possibilities of this programming language. It all started when I was watching another episode of The Coding Train, a great and often hilarious YouTube channel from Daniel Schiffman. In this show Daniel Schiffman takes on coding challenges. These coding challenges can be a physics simulation, data visualization or computer vision. While watching the show I was wondering which tool would be suitable to take on these challenges myself. Schiffman is mainly using Processing and P5.js which aren't in my skill set. I have a basic understanding of Python but not enough to start coding these challenges. OpenSCAD has become the programming tool that I'm most familiar with so I figured to give it a try. OpenSCAD is pretty well equipped for creative coding. No need to import additional modules or libraries to draw onto the screen. It also comes with ready to use 2D and 3D primitives, geometric transformations and boolean operations for 2D and 3D primitives. OpenSCAD is a functional programming language as opposed to most common programming languages such as Python, C and Java which are imperative languages. In OpenSCAD variable keeps one value so i = i + 1 won't work and f(x) will always produce the same result for a given x (as in mathematics). Once you get your head around that working with OpenSCAD becomes easy. OpenSCAD doesn't disappoint for creative coding. Although some challenges didn't seem possible with OpenSCAD, because of the limited animation features of the program (or my lack of understanding of these features, others could be easily achieved with it. Below are examples of challenges that I did with OpenSCAD. 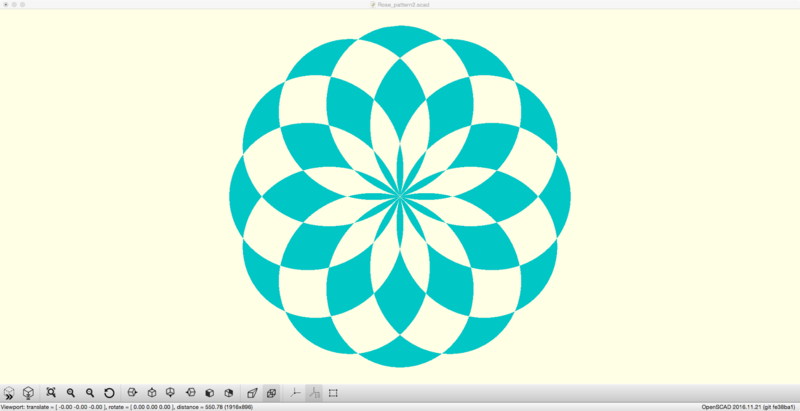 Mathematical rose pattern made in OpenSCAD. Phyllotaxis pattern made in OpenSCAD. Along the way I discovered that I'm not the only one using OpenSCAD for creative programming. I like to mention the website openhome.cc which has an excellent OpenSCAD section. This section not only explains the underlying fundamentals of OpenSCAD but also has creative chapters about spirals, turtle graphics and maze.